Pretty much anything green is acceptable. Leprechaun attire, clovers, and green hats are highly recommended. Remember to be original and put your own touch on your outfit! Are there standard days when all these great parades take place each year? The Irish Channel parade usually takes place on the Saturday prior to March 17. The Metairie Road parade usually takes place on the Sunday prior to March 17. The walking parade through the French Quarter always takes place in the evening on March 17. How can I be a participant in these parades? If you would like to inquire about riding in any of the below parades, please shoot us an email and we'll send it along to the krewes. 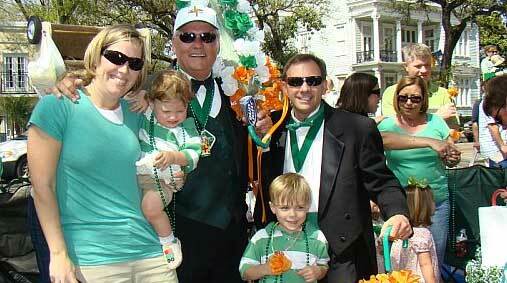 For the Metairie Road parade - contact: St. Patrick's Parade of Jefferson, Inc.